Samsung Galaxy A9 (2018) will go on sale for the first time in India today. The new model that is touted to be the world’s “first rear quad camera” smartphone was launched in the country last week. It sports four separate rear cameras on a setup that features telephoto, ultra-wide, and depth sensors. For selfies, the Galaxy A9 (2018) also sports a 24-megapixel sensor at the front. Samsung has also provided a full-HD+ Infinity Display panel with an 18.5:9 aspect ratio. The Galaxy A9 (2018) also comes preloaded with Bixby voice assistant and features a 3D Glass curved back. The Samsung Galaxy A9 (2018) price in India starts at Rs. 36,990 for the 6GB RAM model, while its 8GB RAM variant is priced at Rs. 39,990. The smartphone comes in Bubblegum Pink, Caviar Black, and Lemonade Blue colour variants. It will go on sale in the country through all online (Airtel Store, Amazon, Flipkart, Paytm Mall, and Samsung Shop) and offline channels starting today – at the time of writing, it was not yet available to buy on these platforms. But ahead of its availability, the Galaxy A9 (2018) is available for pre-booking. Customers will be able to avail a cashback worth Rs. 3,000 when purchasing the Galaxy A9 (2018) using an HDFC debit or credit card. Samsung has partnered with Bharti Airtel to offer the Galaxy A9 (2018) 6GB RAM variant through the Airtel Online Store at a down payment of Rs. 3,690 and EMI of Rs. 2,349. Customers can also buy the Galaxy A9 (2018) 8GB RAM model through the Airtel Online Store at a down payment of Rs. 4,890 and EMI of Rs. 2,449. Moreover, the customers purchasing the handset through the EMI options will receive Airtel postpaid plan bundles along with benefits such as unlimited voice calls, national roaming, and a free subscription to Airtel TV. The Galaxy A9 (2018) was launched in India last week, and it was unveiled globally at an event in Kuala Lumpur, Malaysia last month with a starting price of EUR 599 (roughly Rs. 47,900) and GBP 549 (roughly Rs. 49,600). The dual-SIM (Nano) Samsung Galaxy A9 (2018) runs Samsung Experience UX based on Android Oreo and features a 6.3-inch full-HD+ (1080×2220 pixels) Infinity Display that has a Super AMOLED panel and an 18.5:9 aspect ratio. It is powered by an octa-core Qualcomm Snapdragon 660 SoC that has four cores clocked at 2.2GHz and four cores clocked at 1.8GHz. This is coupled with 6GB and 8GB RAM options. 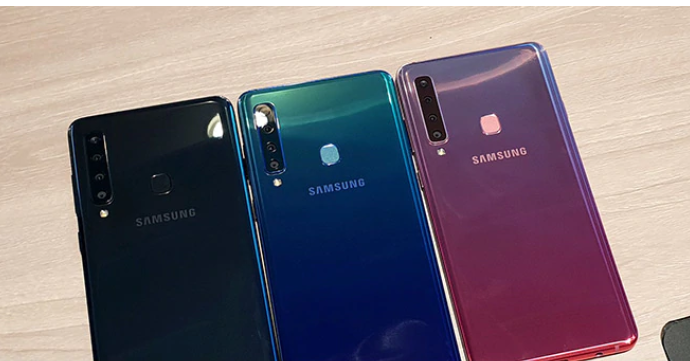 For images and videos, the Galaxy A9 (2018) has a quad camera setup at the back as its USP, along with an LED flash. The setup includes a 24-megapixel primary sensor along with an f/1.7 aperture, a 10-megapixel telephoto sensor with 2x optical zoom and an f/2.4 aperture, an 8-megapixel ultra-wide sensor with a 120-degree lens supporting an f/2.4 aperture, and a 5-megapixel depth sensor with an f/2.2 aperture. The primary sensor notably uses a pixel binning technique to combine four pixels into one. On the selfie front, there is a 24-megapixel sensor at the front that comes with an f/2.0 aperture. The frontal sensor enables a preloaded Face Unlock feature. Samsung has provided the ability to recognise 19 different scenes and optimise colour settings to produce shots matching the content. The Galaxy A9 (2018) also detects flaws such as closed eyes, facial blur, or backlight in the images you clicked and notifies you to re-click them. For the front camera, there are features such as selfie focus and pro-lighting. There is also an AR Emoji feature to let you create up to 36 animated emojis. The Galaxy A9 (2018) comes with 128GB on internal storage that is expandable via microSD card (up to 512GB). n terms of connectivity, the phone has 4G VoLTE, Wi-Fi 802.11ac (dual-band, 2.4GHz and 5GHz), Bluetooth v5.0, USB Type-C, NFC, and a 3.5mm headphone jack. Sensors on board include an accelerometer, ambient light sensor, gyroscope, magnetometer, proximity sensor, and an RGB light sensor. There is a rear-facing fingerprint sensor. Besides, there is a 3,800mAh battery that supports fast charging.